I first made this pie for Thanksgiving a few years ago when looking for something different to try. I made a few changes to the original recipe, including using a sugar cookie crust instead of a regular pie crust. This cinnamon apple custard pie soon became a favorite because it was different and it was easy. There are no complicated ingredients, and it can be made crustless so that it can be made without a stoven. 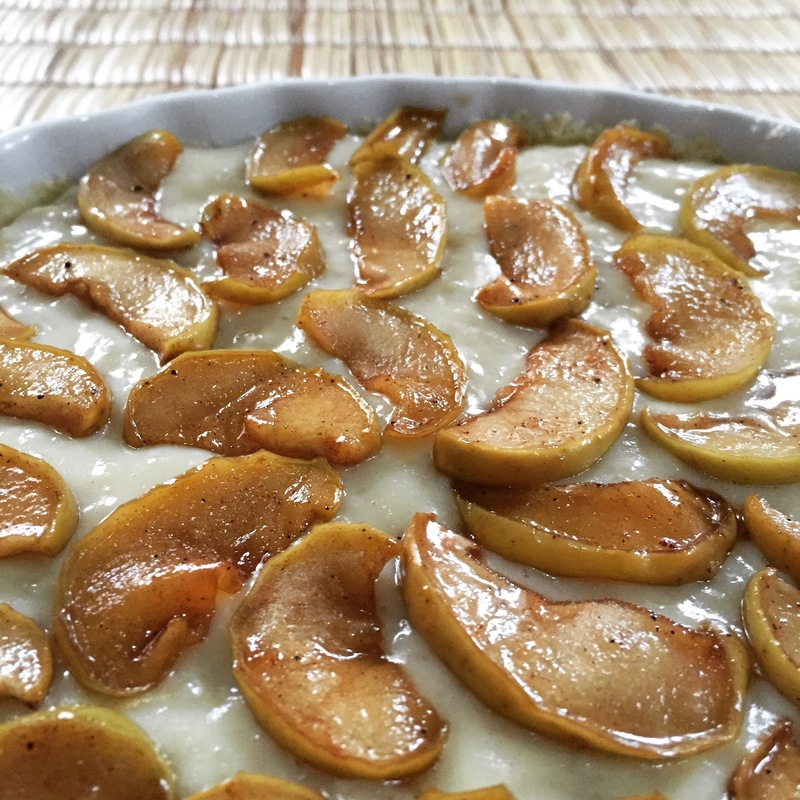 The custard and apples are prepared on the stovetop, which makes this a perfect recipe for Swaziland, too. And finally, the pie does not have to be made in a pie dish, especially because I have yet to find a true glass pie dish in Swaziland. I have been using a quiche dish I bought at Punch Bowl in Manzini for E25. The first time I made the cinnamon apple custard pie in Swaziland I used a glass loaf pan from Shoprite for E25. I also used pears instead of the apples. The pie could just as easily be made in a square cake pan or baking dish, as well. You will prepare the apples first and cook them in a skillet until they begin to caramelize. Then, you will make the custard, which is made from egg, flour, sugar, and milk. Then, you will make the sugar cookie pie crust and bake the crust for 10 minutes. Finally, you will layer apples, custard, and more apples in the pie crust. Slice apples. Peel if desired. Heat skillet with margarine. Add apples, sugar, cinnamon, and nutmeg. Cook for roughly 40 minutes until the sugar has thickened but has not caramelized. Once the apples are cooking, start the custard. Bring milk, sugar, salt, and vanilla to a simmer in the pot. Separately, whisk together the egg and egg yolk. Once the milk is simmering, gradually whisk in the flour. Remove the milk mixture from heat and pour 1/3 of the mixture into the eggs. Whisk together slowly to avoid scrambling the eggs. Return to pot once combined. Cook and whisk continuously for 30 seconds and then remove from heat. Custard will be lumpy. There is no way to avoid this, plus you know when it is lumpy that it is home made. While waiting for milk to simmer, begin crust. Combine margarine, sugar, and egg yolk. Mix in flour and salt. Mixture should be crumbly. Pat mixture into pie dish. Bake at 190 C for 10 minutes, rotating 180 degrees at 5 minutes. Once the cinnamon apples, custard, and sugar cookie crust are complete, begin assembly. Pour two-thirds of the cinnamon apples over the crust. Then pour custard over apples and allow it to set for one hour, preferably in the refrigerator. Finally, top with the remaining cinnamon apples before serving. Recipe is based on Martha Stewart’s apple custard pie. This entry was posted in Africa, Peace Corps, Swaziland, What's cooking and tagged Africa, baking, Food, PCV, Peace Corps, Peace Corps Volunteer, Pie, Swaziland. Bookmark the permalink. Thank you! It’s quite delicious. You make beautiful pies. I am jealous. I have eaten similar pies but nothing like this! Thanks for sharing !